Our first ginger lily of the year began opening a few days ago, wafting its intoxicatingly sweet fragrance across our garden. These hardy perennials return year after year, growing to over 7 ft high in our garden. I remain grateful to our neighbor who offered to let me dig some of these beauties from her garden in the weeks before she moved. I’d never grown these before, and simply trusted that we would enjoy them. We had space for them to spread, and spread they have in the years since. 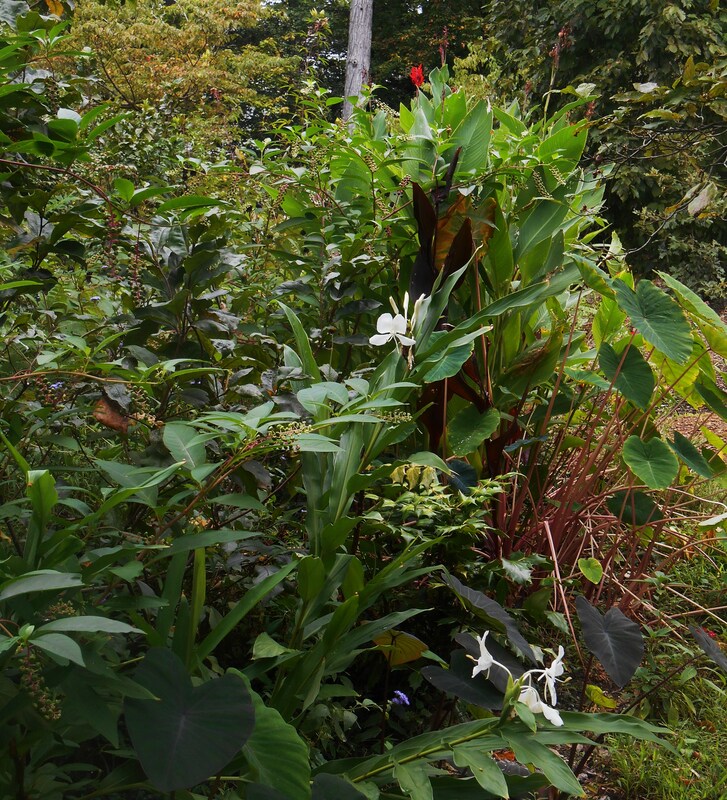 This part of our garden grows dense and tropical and full of life. Oh my! What a treat we look forward to in late summer each year, when our ginger lilies bloom. 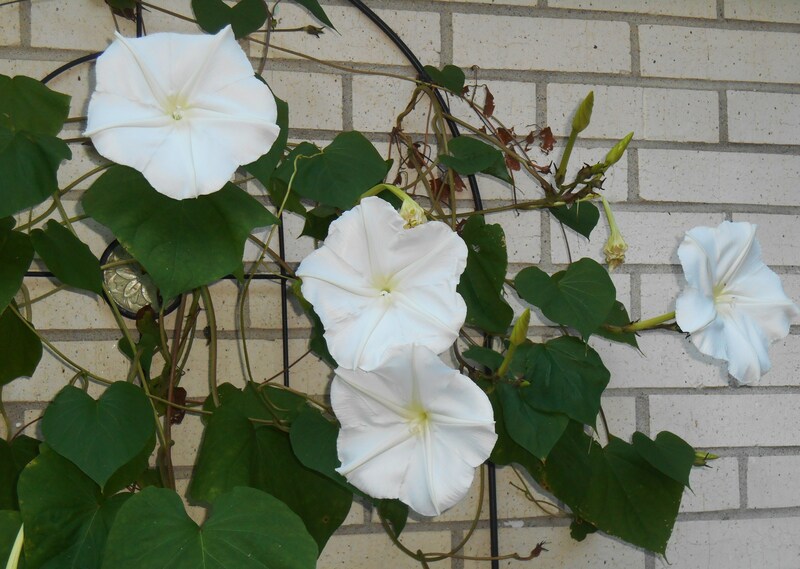 Getting reacquainted with their pure white flowers today has made this a Fabulous Friday, indeed. Fabulous Friday: Happiness is contagious, so let’s infect one another! The flowers of late fall and early spring bring us the most pleasure. That may be because we can actually enjoy our time outside in the garden with them! It is ‘Goldilocks’ comfortable now from dawn until dusk, and our enthusiasm for the garden is re-ignited. This area of the front garden gets the most attention these days, as I move shrubs and perennials into these new beds from their pots. We both spent most of yesterday outside. Knowing that a frost can come now at any time, and that night time temperatures in the 40’s may come this weekend; our pleasant days and frost free nights may be counted on our fingers… and possibly toes, if we are fortunate! I set out yesterday to fill promises made weeks ago to share our Ginger Lilies. 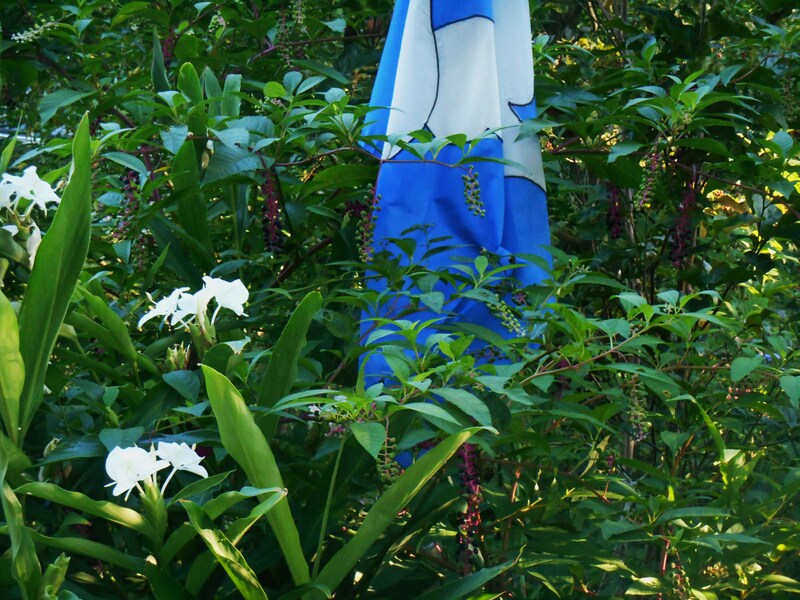 Our Butterfly Ginger Lilies fill the air with their sweet perfume. A gardening friend joined me mid-morning and took all she could use of the freshly dug tubers. 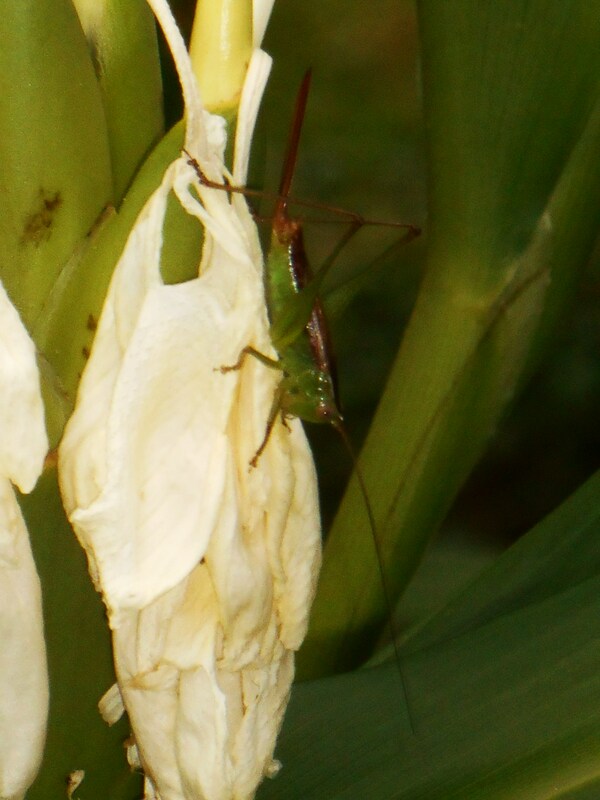 A new neighbor, designing his own wildlife habitat along our shared pond, collected a dozen more Ginger Lily starts that afternoon. My poor shaded, crowded roses are breathing more freely now, with fresh compost around their roots. Another crowded rose, this one by an exuberant Lantana. 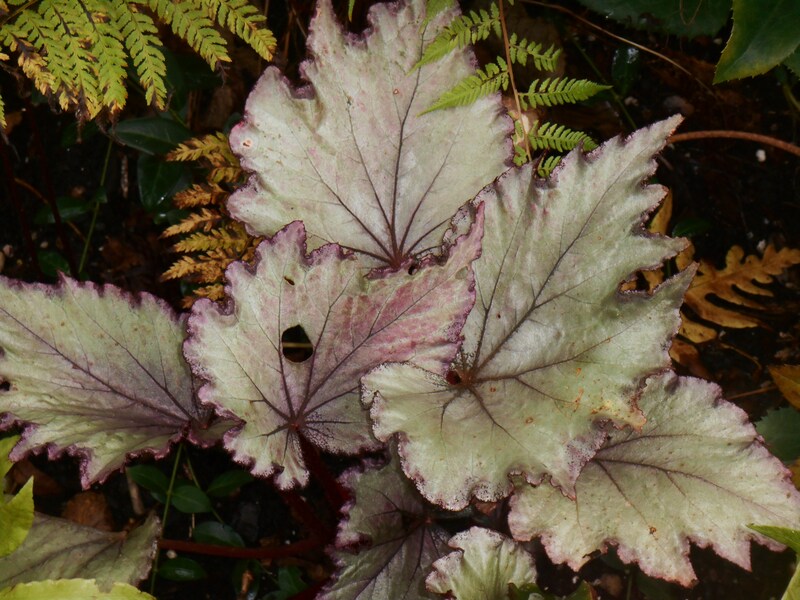 I also shared some seedling Beauty Berry shrubs, a few stems of our wonderful hardy Begonia, and some tender ferns. 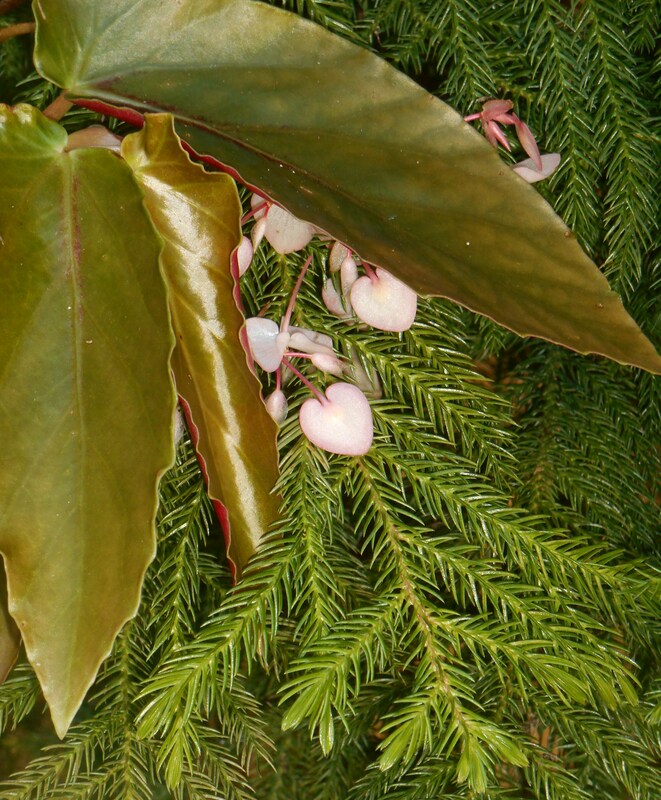 Time for this tender Begonia to come back inside for another winter. The time has come for the “Who will survive the winter?” lottery as we decide which of the tender plants will come in before the nights turn truly cold. My first instinct always is, “All of them!” But as we survey available space, reality sets in. And I begin pressing my friends to adopt a plant for the winter. 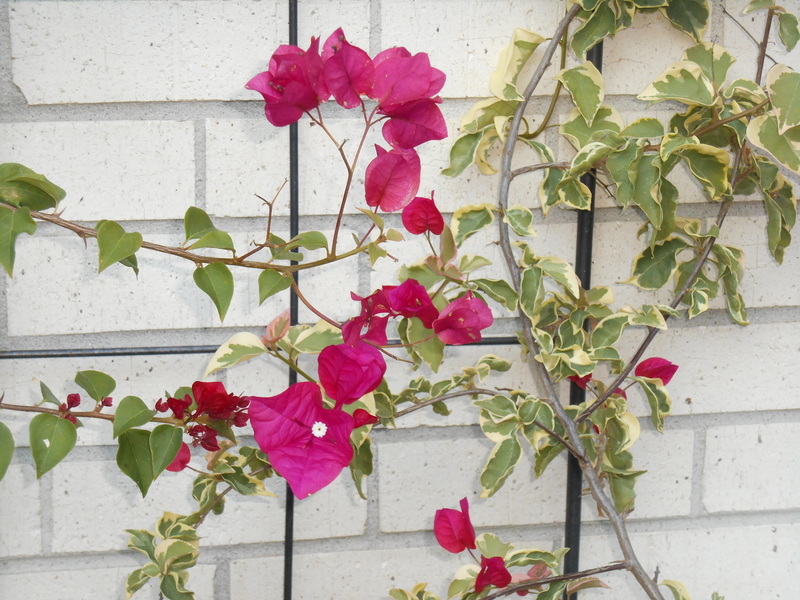 These Bougainvillea lives in our garage once nights grow cold. I learned several valuable lessons about keeping plants over winter last season. I learned that a number of plants, like Colocasia, will survive just fine in the low light of our basement. I also learned that it is possible to crowd quite a few Geraniums into a plastic tub and keep them all going in the garage. They kept blooming through Christmas that way. The best lesson, however, required an investment in 5 gal. buckets from Walmart. Who cares if they are covered in camo and deer designs? They were only $3 each, and each perfectly held one of our hanging baskets through the winter. With plastic bags under the buckets to protect the floor, I could water the baskets with confidence, knowing they drained into the buckets. I also purchased those kitschy ‘watering globes’ for the baskets; which work very well by the way. I could fill the globes once a week or so to keep the baskets hydrated enough to survive our winter. These tender ferns will get moved inside before Sunday evening. Yes, it takes a lot of effort to keep plants over winter, but that effort is also rewarded. 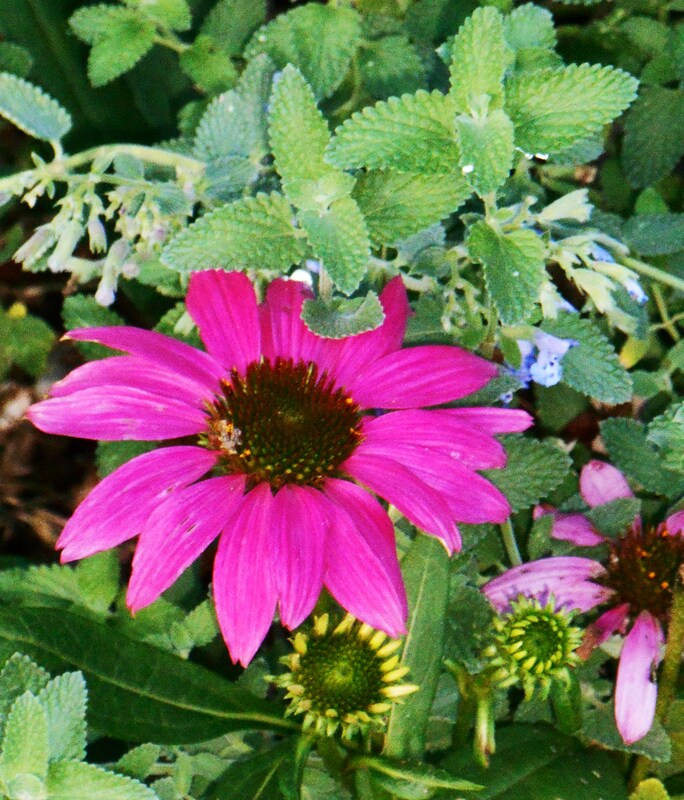 Watching overwintered plants come back into bloom the following season brings a special joy. 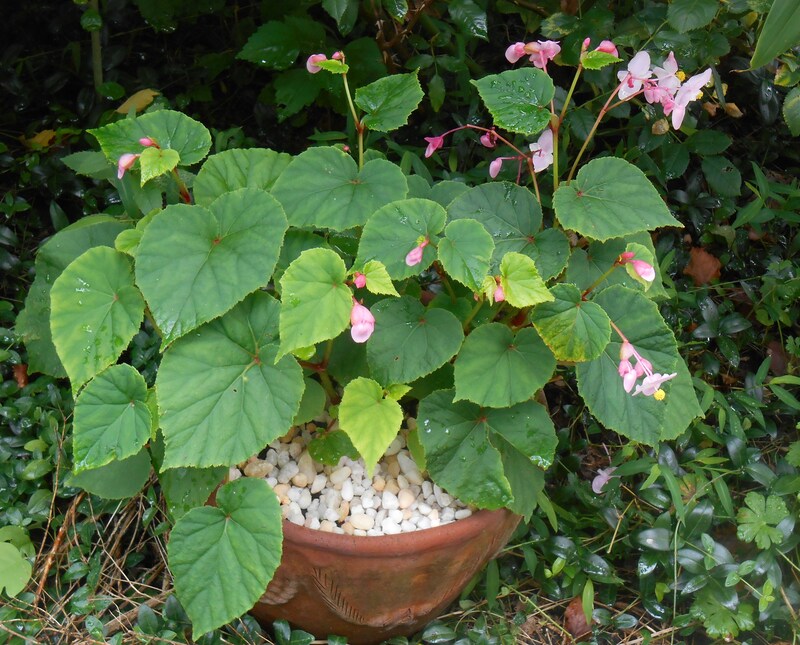 Since I collect so many specialty plants, like Begonias, I may find a particular cultivar only once in many years. Losing it means, well, losing it. There is no guarantee that a freshly rooted version will be waiting on the nursery shelves next spring. This is a tender Salvia and most years doesn’t survive our winter. 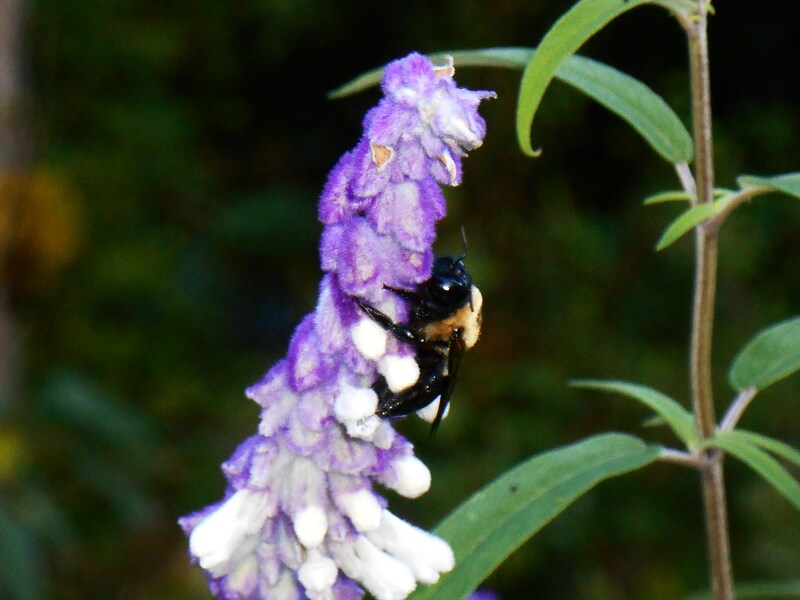 Our bumblebees are already feeling the chill in the air. That makes October’s Garden Blogger Bloom Day especially poignant. My Zone 7 garden has reached its peak for the season. 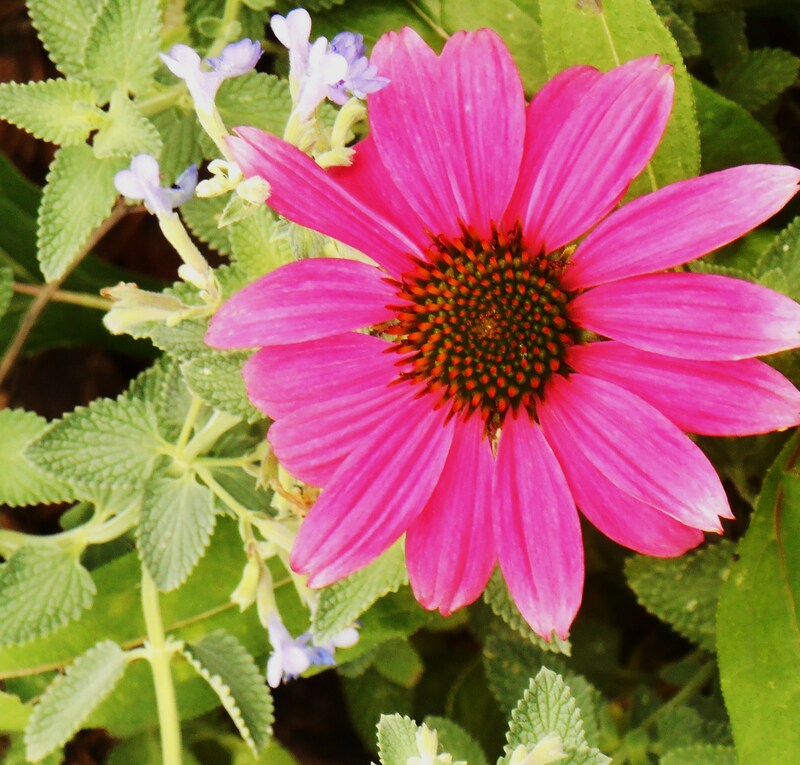 We will enjoy these beautiful flowers while they last, knowing that frost will soon transform our garden, once again. 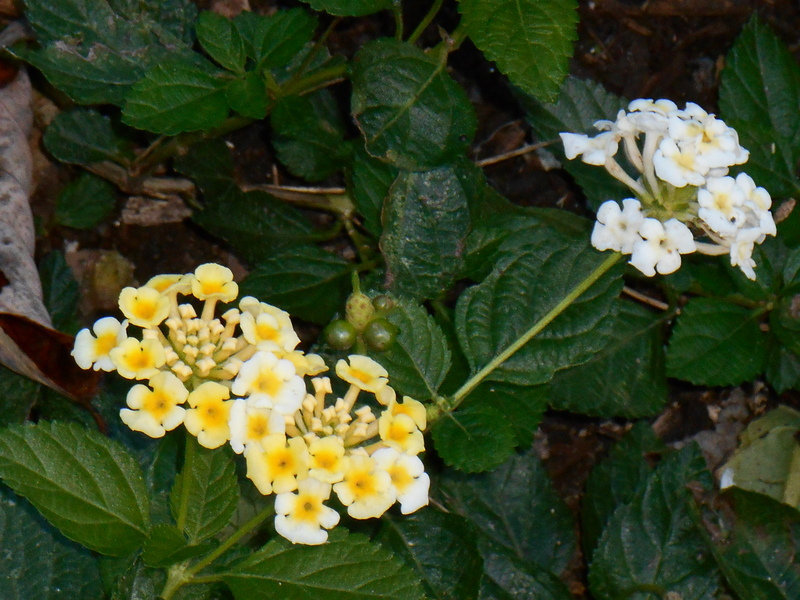 Many of our Lantana prove hardy. We expect this new cultivar to survive winter in place out of doors. But I hope to transform it first, digging and moving tender perennials to pots inside, crowding them into their makeshift ‘garage greenhouse’ and planting hardy Violas and Heucheras in their places. These hardy perennials will die back with the frost, but then return in early summer. I’ve also started pots of hardy Cyclamen and Arum lily, which will come outside to the garden next week. We’re off today to pick up more bulbs for spring flowers, and then I’ll put those compost covered gloves back on; and head back outside for another golden afternoon in our October garden. 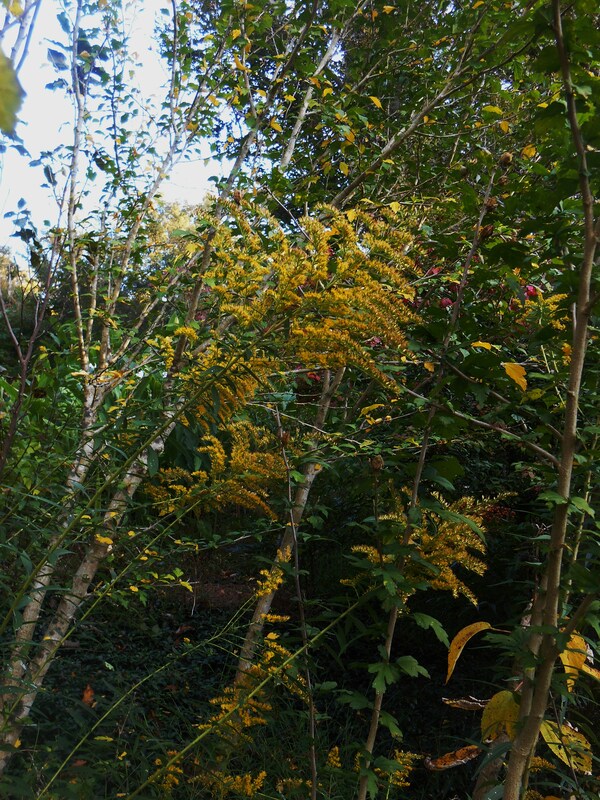 Goldenrod volunteers in odd places around the garden, adding its golden glow to the changing leaves. Friends and followers might have noticed that my posts have been few and far between recently. I’ve not been a faithful visitor to friends’ blogs, and it has taken a bit longer than usual to answer comments. Even my local friends haven’t gotten much love lately! I intend to soon do better. Lately, there has been a lot on my plate, and most of it good, actually. But it hasn’t left much uncommitted time for me in the garden, with the camera, or at the computer. And it hasn’t left much time for my treasured friends. All of us who blog for more than a few weeks find ourselves with stretches when our time is committed elsewhere. But then things slow down, and we find ourselves with enough time to visit and to construct our usual posts again. I was afraid to take my computer back to them for repair after the major problems I had re-configuring everything last time they worked on it. It took me a day to realize they hadn’t re-set the correct date and time, and that is why websites wouldn’t load…. The computer was telling websites it was still stuck back in 2008….. I assume that if you are reading this, you understand the trauma involved. I use my computer for many hours each day, for many different applications. Having to recover ALL of the settings, passwords, configurations and files is a tremendous task. Especially when all of those things were set up bit by bit over the last many years! I don’t like buying new technology. Rather, I’d rather keep my comfortable and familiar set up going as long as it fills my needs. And so when I finally brought a few key projects to a close, I decided it was time to hold my breath and let my trusted brother, who has been building and re-configuring computers since he was about 10, install the new Mother Board. Let’s just say we have been spending a lot of quality time together these last few days. As of late Saturday evening, when he finally closed everything back up and left, things looked pretty grim. My camera couldn’t talk to my hard drive. The printer was a lost waif. No sound was uttered by the speakers. And the USB ports were all dead. But, the internet worked…. slowly. And so we limped along until everything crashed yesterday while ‘essential updates’ loaded. But I was away for the day and not here to even push the button to power off. My partner was left with that grim task. But my beloved brother returned today with his laptop, restoration disks, spare memory chips, tool kit, I Phone and confidence that he wouldn’t leave until my computer was restored. We tore everything back down to the Mother Board again, reconnected it all; and then began building up again from a new operating system right through all of the little drivers, settings, software downloads and back-ups to get me operational again. He is simply amazing. And I learned so much just watching him work. And that is why my post tonight is about technology and not gardening. Sure, I’m sharing garden photos with you that I’ve been taking since Saturday. We couldn’t download them until late this afternoon. But there has been no ‘Vase’ today, no ‘Sunday Dinner’ posted while I was traveling yesterday. And truthfully, there hasn’t been much gardening going on these last few days here, either. But we’ve had cool nights and delicious rain. Our weather has shifted to feel like the beginning of autumn. I hope that blogging life will soon come back on schedule, and that I’ll soon be a faithful visitor once again. At least I was finally able to log back onto WordPress and write a post. And so for tonight, I’ll hope you enjoy these few photos of our garden after the rain. All is well in my world, and tomorrow is another day…. “The most fatal illusion is the settled point of view. there is to be found in living. that is how you look at things. whatever is good or bad. 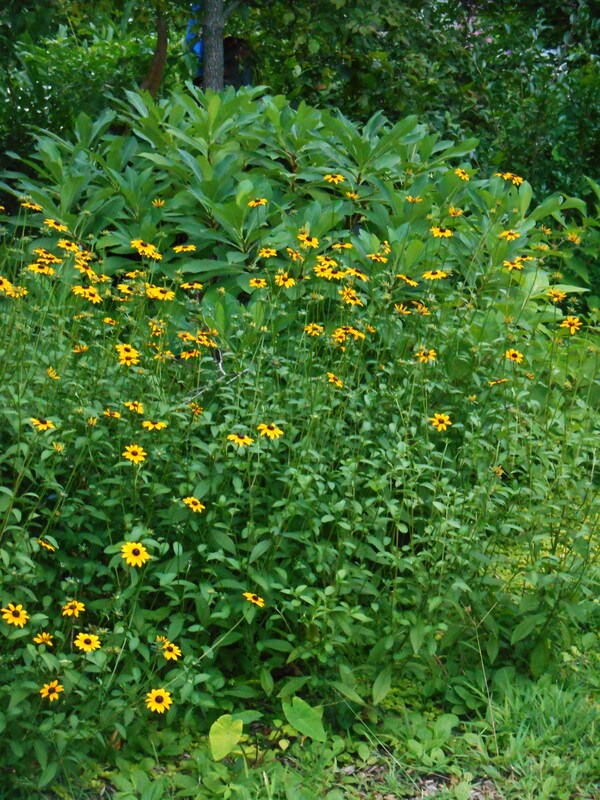 These Black Eyed Susans were growing in another part of the garden when we came here, but we spread the plants around when they emerge each spring. The clumps spread and also self-seed. Is there a large area in your garden which you would like to fill with plants with a minimum investment of cost and effort? Many of us have large areas to tend, and welcome plants which make themselves at home, colonizing the surrounding real estate. 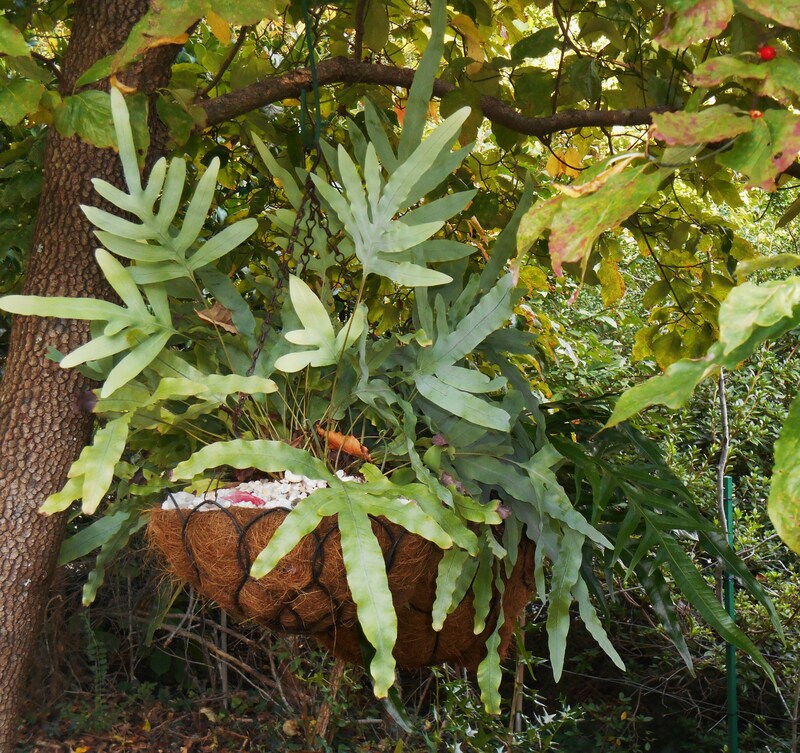 If we like a single specimen, we might also enjoy a larger area filled with the same plant. 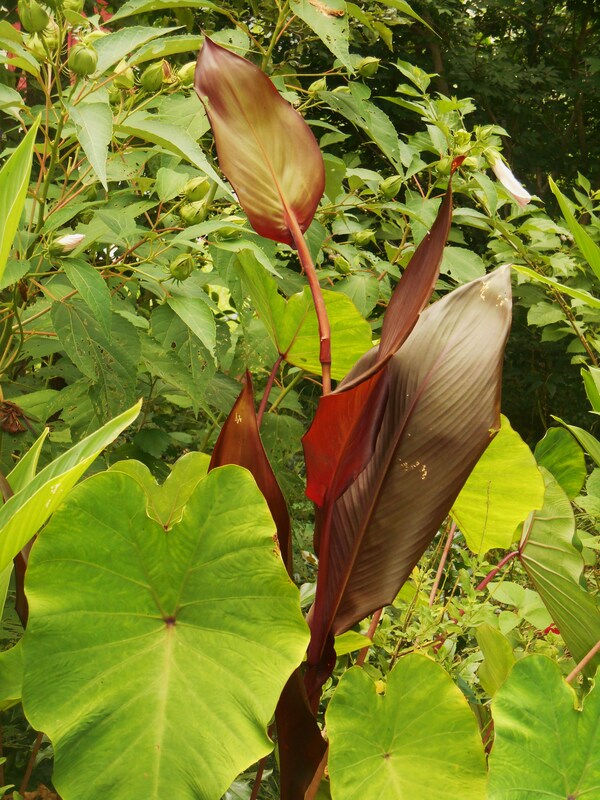 Colocasia ‘China Pink’ growing with Canna lily and hardy Hibiscus. One way to accomplish this is by buying multiples of a single plant to begin with; say seven or nine or thirteen pots of the same cultivar, planted together in a large bed. If your budget doesn’t allow such a splurge very often, consider buying plants which spread themselves around in a fairly short time. Most of these spreading plants grow radiating stems which creep along just under or just above the ground. 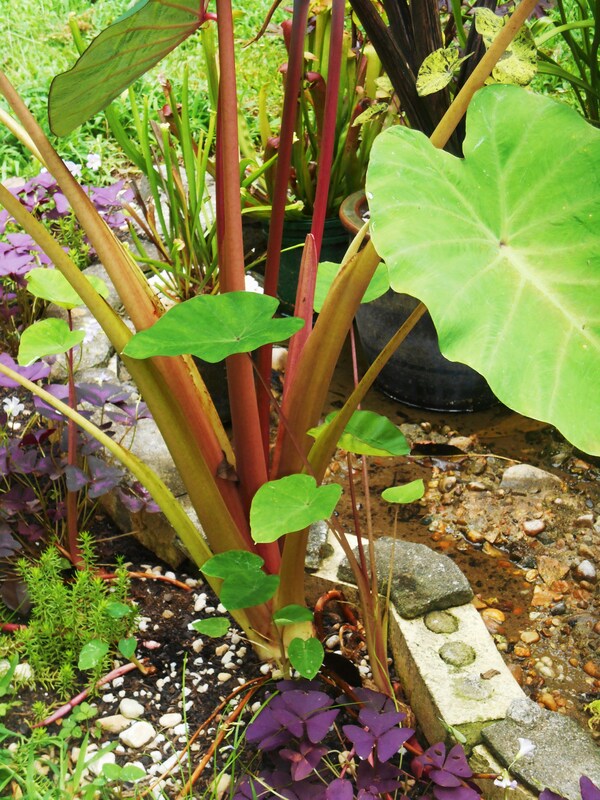 A new plant begins to grow from a Colocasia runner. As the stems grow away from the original plant, they send up new sets of leaves some distance away, and root at that spot to form an entirely new plant. Over time, each of these new plants will send out its own runners. The new plants can be cut away and replanted elsewhere or allowed to grow in place, thus expanding the original planting. Many plants spread themselves in this way, eventually forming dense colonies. Some begin to crowd themselves out after a year or two and appreciate thinning. Others may be left alone indefinitely. 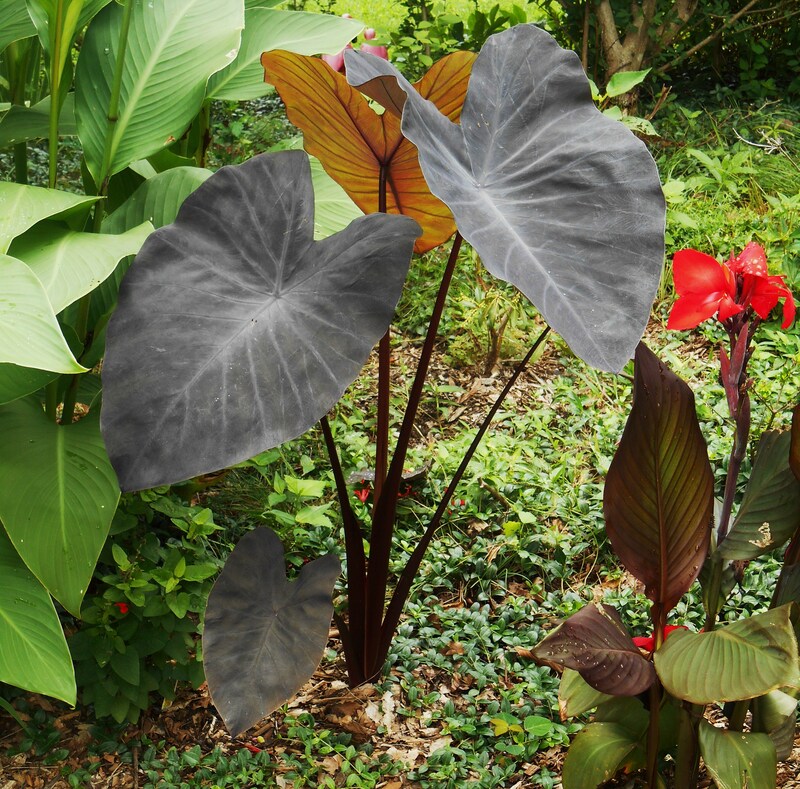 Clumping Hazel trees form the backdrop to this bed filled with hardy Colocasia and Canna lilies. 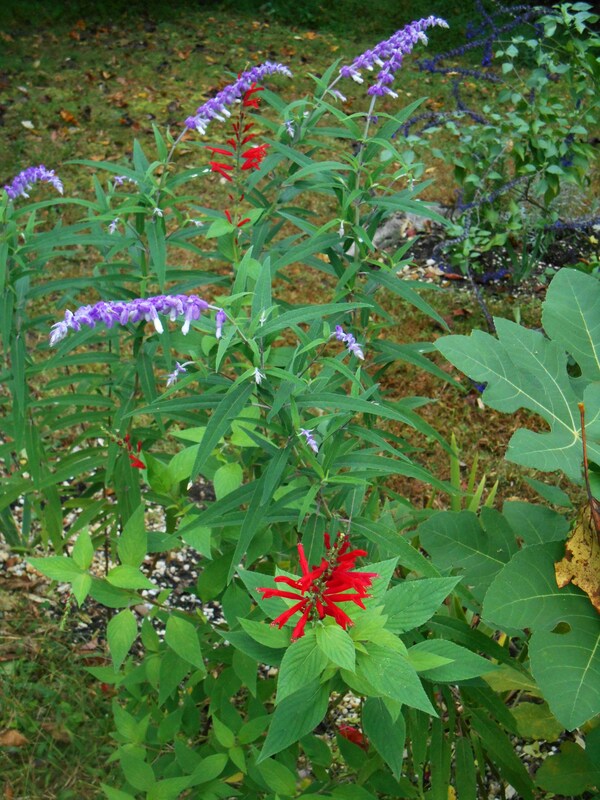 The bed was planted this spring from divisions of established plants. 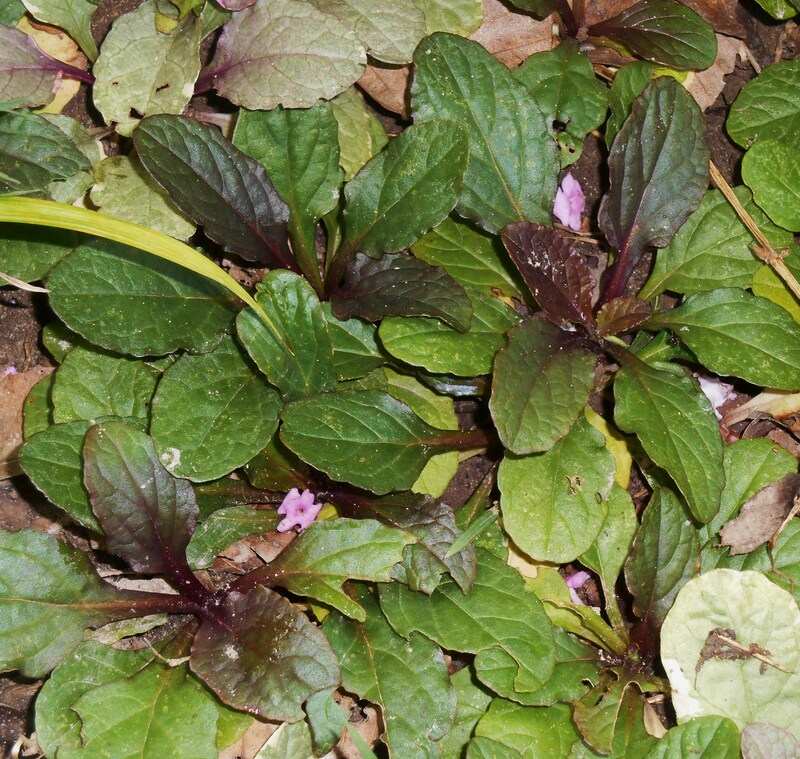 In fact, many of the plants we consider ‘invasive weeds,’ like wild strawberry and crabgrass, spread themselves in this way. Leaving any part of the plant in the ground when weeding may result in a new plant cropping up in a matter of days. 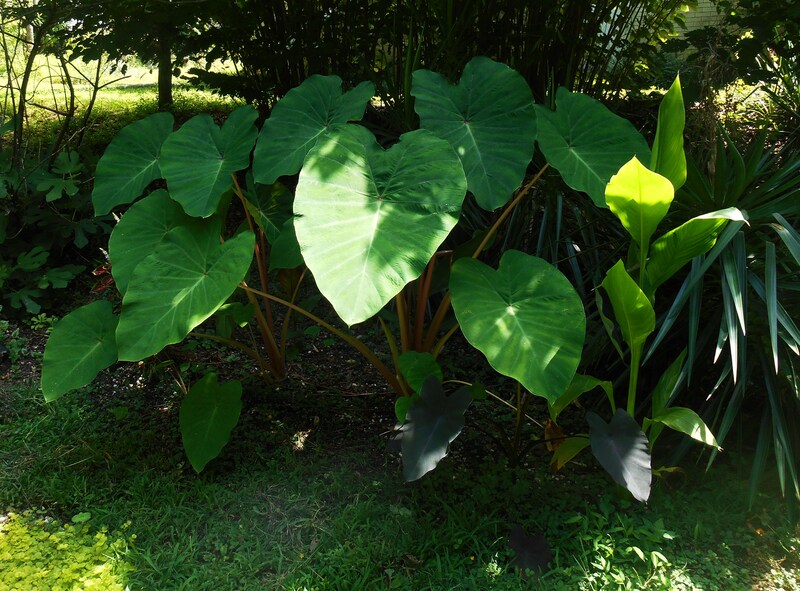 One of my current favorite plants for covering large areas with interesting foliage is Colocasia, or Elephant Ear. These are marginally hardy here in Zone 7. Some cultivars have returned for us while others have died out over the winter. 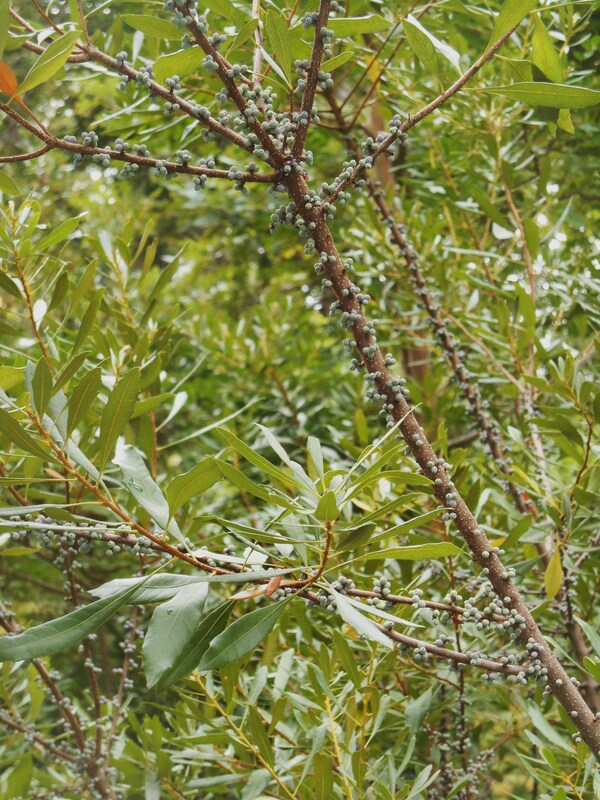 Winter hardiness is an important consideration when choosing a plant to spread. 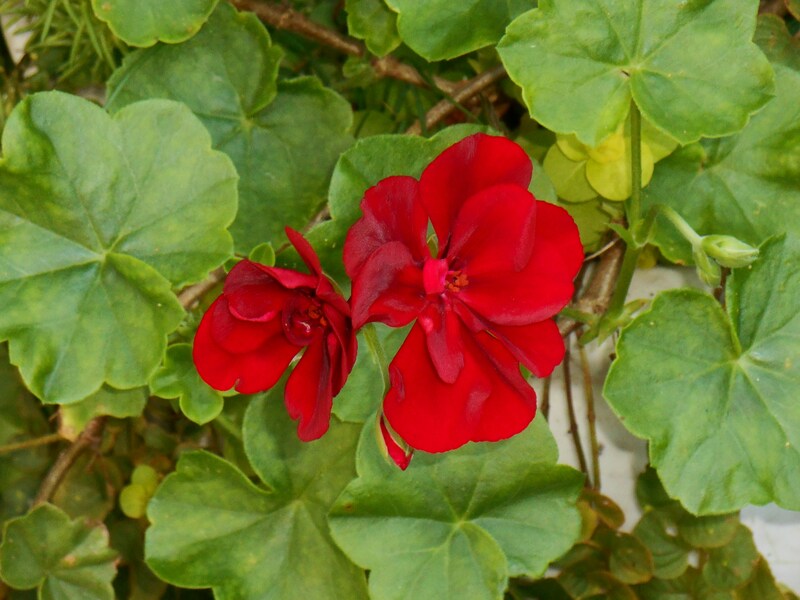 While a tender plant allows one to easily change one’s mind after the growing season; a hardy plant will most likely become a permanent fixture in the garden. It pays to do plenty of research into the plant’s needs and habits before making that initial investment to bring it home to the garden. C. Black Magic, growing in 2014, did not survive our winter. 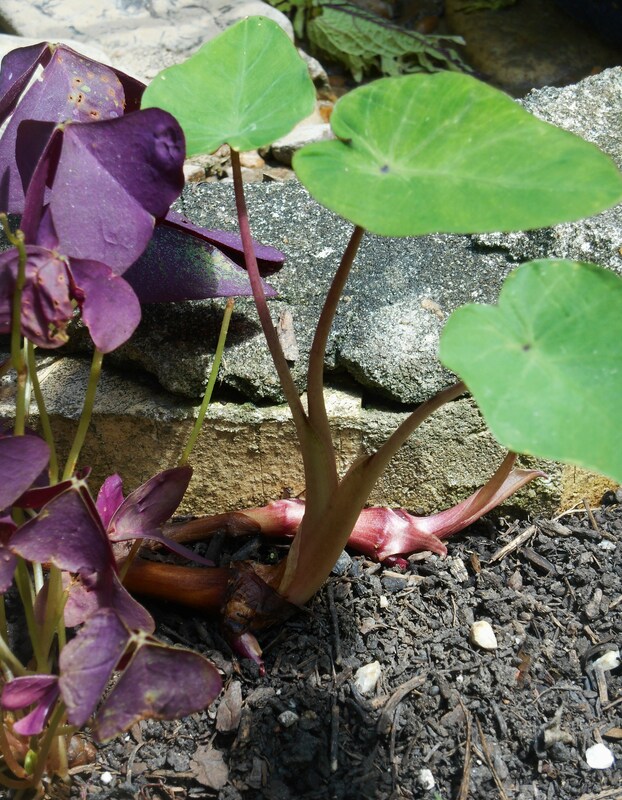 Of the several Colocasia cultivars I planted last summer, only two proved hardy in our garden. The species, C. Esculenta and C. “Pink China” survived our winter. 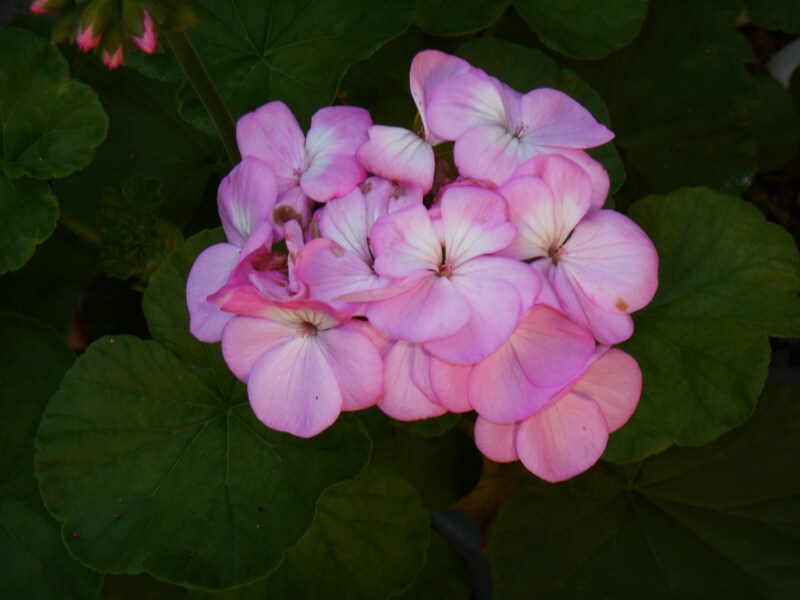 While the species hasn’t spread beyond its immediate area, C. “Pink China” has spread prolifically this year. 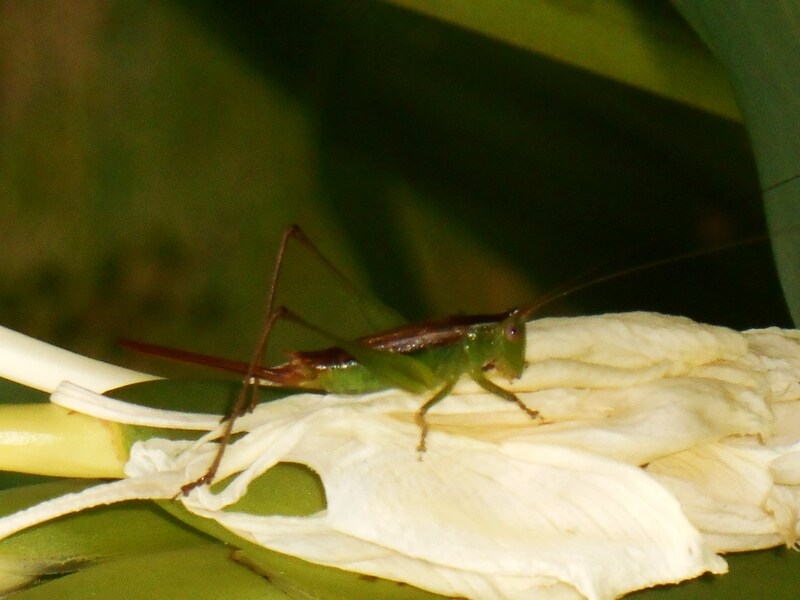 I moved several plants to a new area this spring and they have all sent out runners as well. 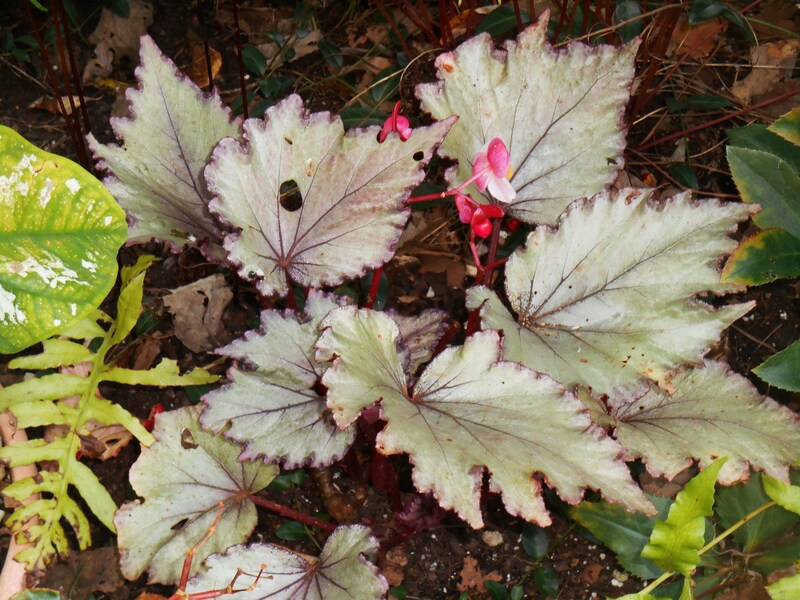 One of the cultivars which didn’t survive our winter was C. “Black Runner,” prized for its ability to spread. Although Plant Delights nursery indicated it is hardy to our Zone 7B, only those plants I kept in pots in the basement survived the winter. 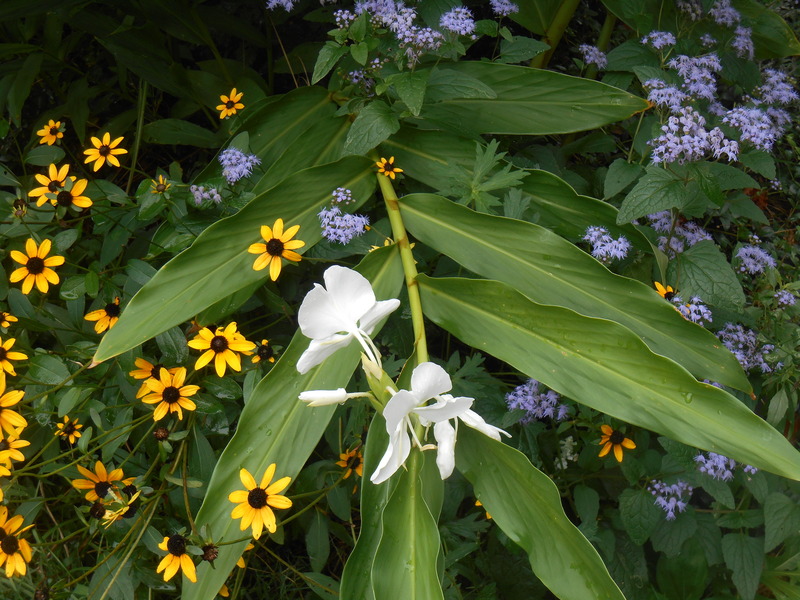 Butterfly Ginger Lily comes into bloom in late August in our garden. 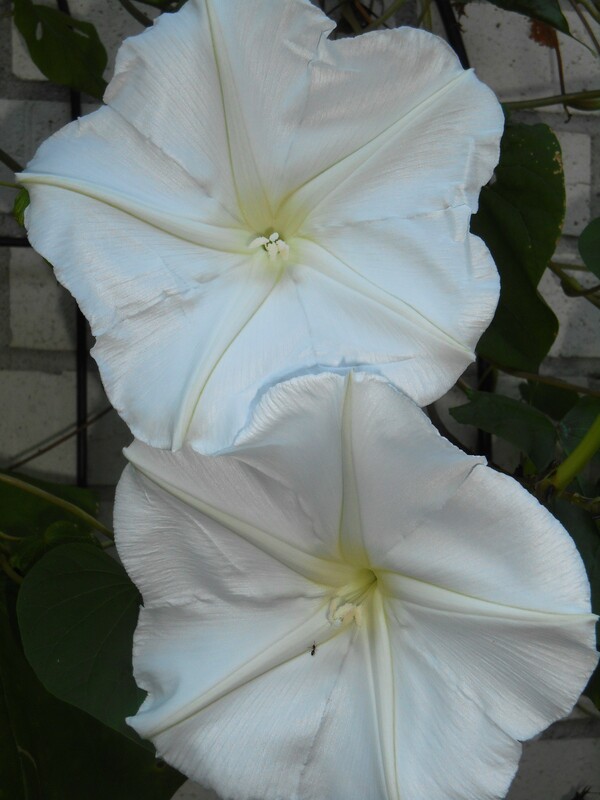 It is very fragrant, perfuming this whole area of the garden for more than a month. 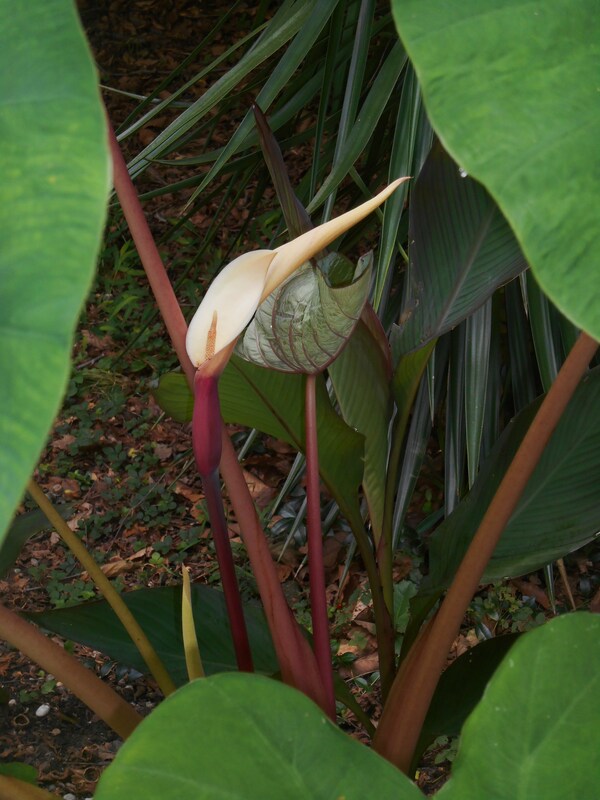 Three large, spreading plants we enjoy in the summer garden are the Colocasia, Canna lily, and our hardy Butterfly Ginger Lily. 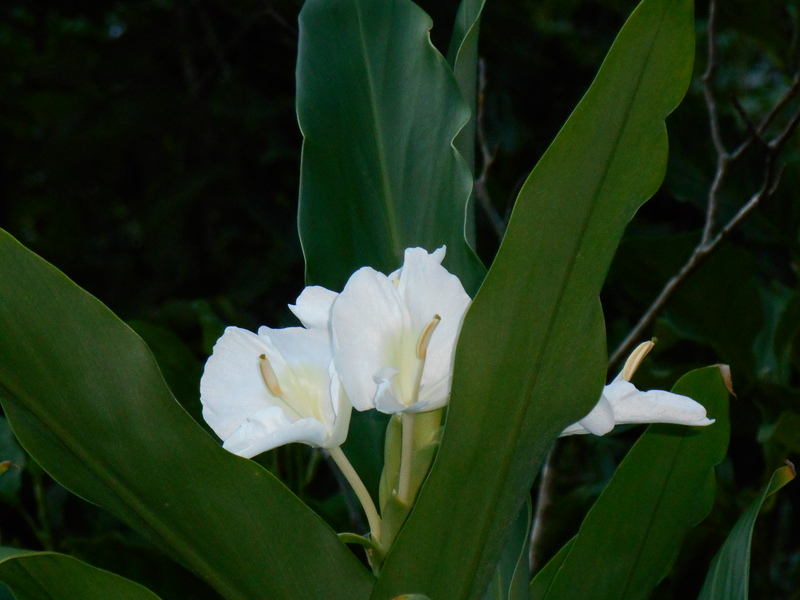 Our first ginger lily, Hedychium coronarium, came as a gift from a neighbor as she prepared to move. She allowed me to dig roots from her garden and I happily replanted them in a new bed near our driveway. These plants die back to the ground each winter, and then grow to around 6′ tall each summer before blooming at the end of the season. Their fragrant blooms keep coming until a heavy frost. 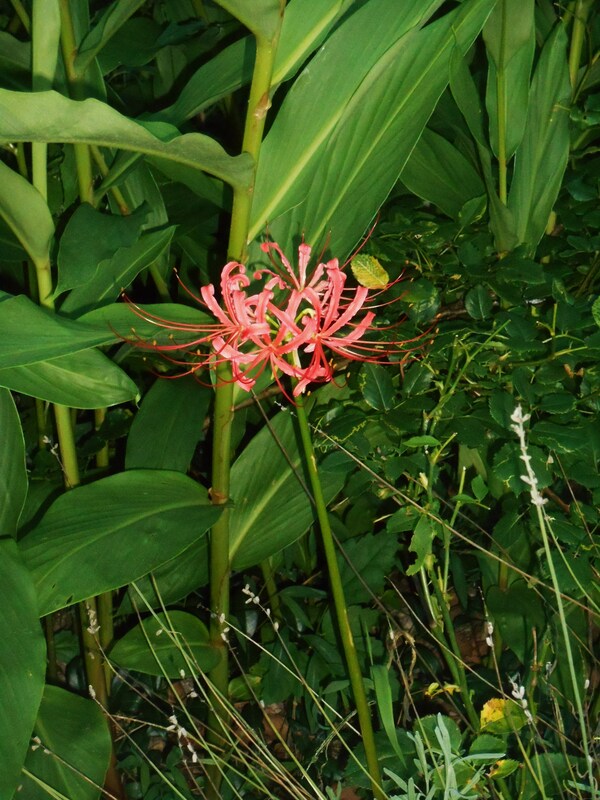 Our first Lycoris of the season blooms beside stems of Ginger Lily. 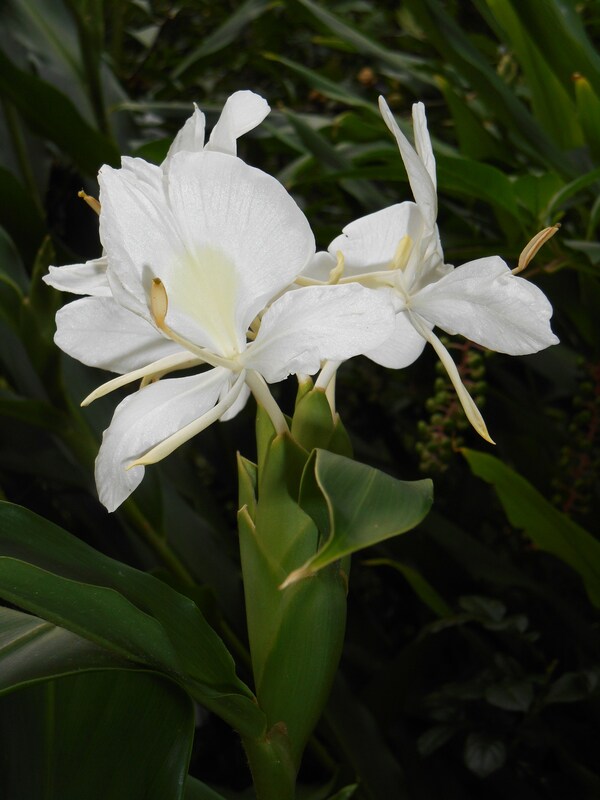 The Ginger Lily create a thick, creeping mat and must be thinned each season to keep them in bounds. I’ve since dug up roots to share and to spread to a wider area of the garden. The stems grow very densely together and make a good screen for about half of the year. 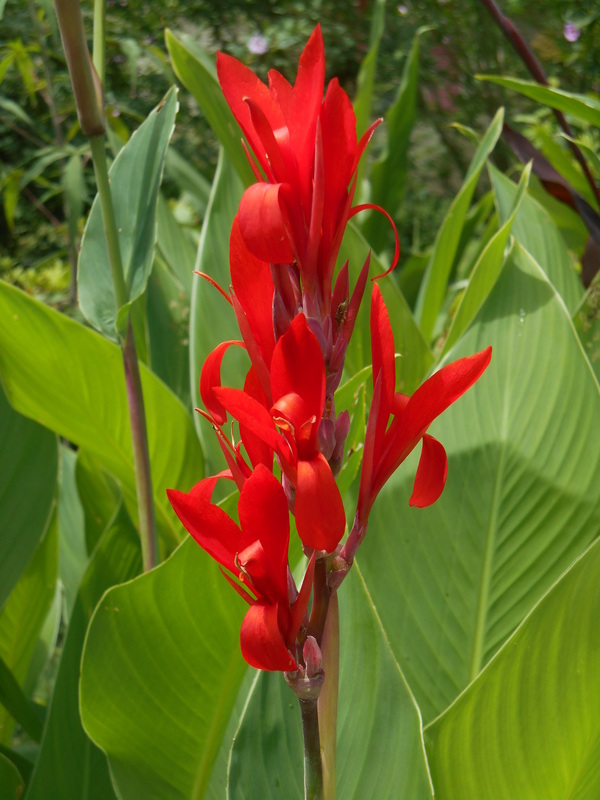 Most of our Canna lily were also a gift from a gardening friend. She brought me a grocery sack of roots dug from her garden late in the summer we lost several tall oaks, transforming our very shady garden to nearly full sun. Although I planted the roots with several feet between each, they have grown to form dense clumps in just two summers. 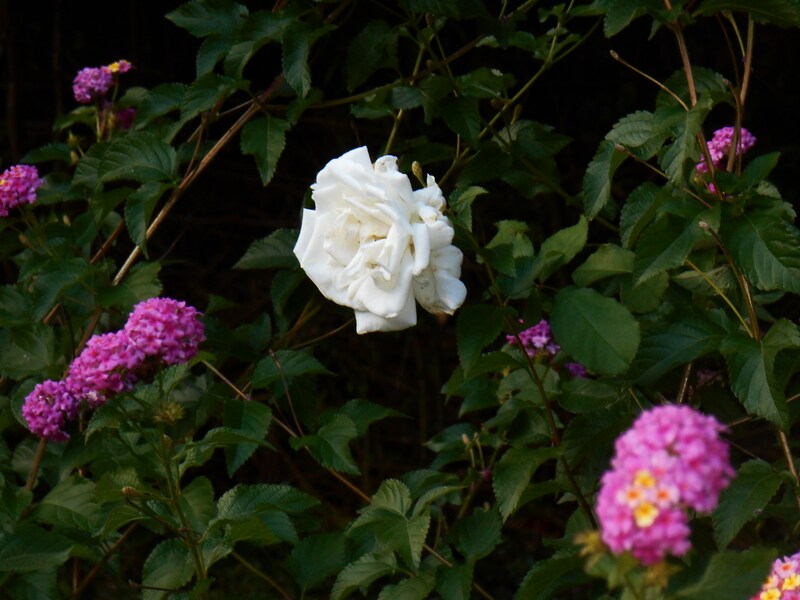 The named cultivars with more ornamental leaves planted last year have not proven nearly as prolific in their growth. 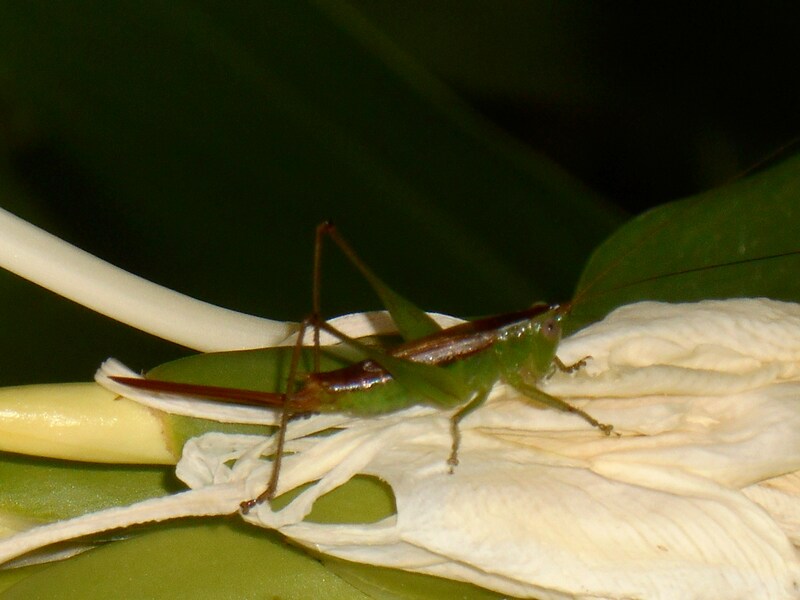 A new bamboo ‘shoot’ emerged far from the bamboo forest, right in front of a fig tree. We cut this down after taking a photo. 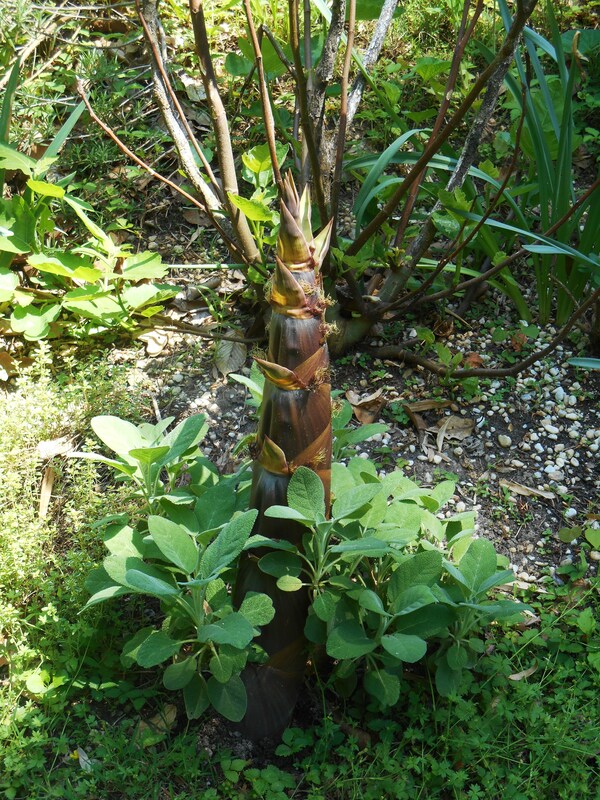 Bamboo, another spreading giant, already grew at the bottom of our garden when we arrived. Technically a grass, its rhizomes now cover much of our lower garden. We are surprised each spring to see where the new stems emerge. We promptly break these off when they emerge out of boundaries for the bamboo. Bearded Iris spread easily when planted in full sun with moist, reasonable soil. They may be allowed to grow into large clumps, or divided and spread around. This is I. 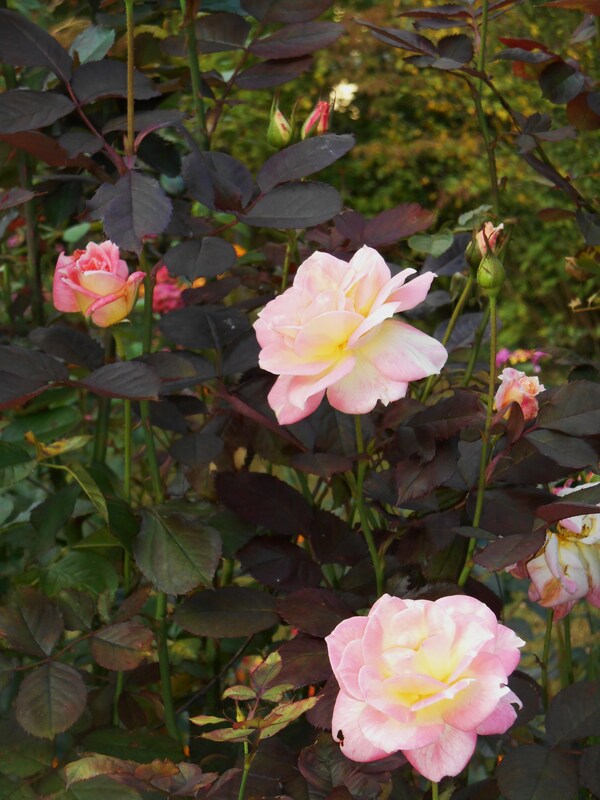 ‘Rosalie Figge’ which blooms reliable again each fall. I’ll shortly be digging these to share with our next door neighbor. We enjoy several other hardy perennials which spread over time, although on a much smaller scale than these lovely giants. German Bearded Iris quickly grow to form large clumps when they are happy with the light and soil. They prefer full sun and reasonable soil. 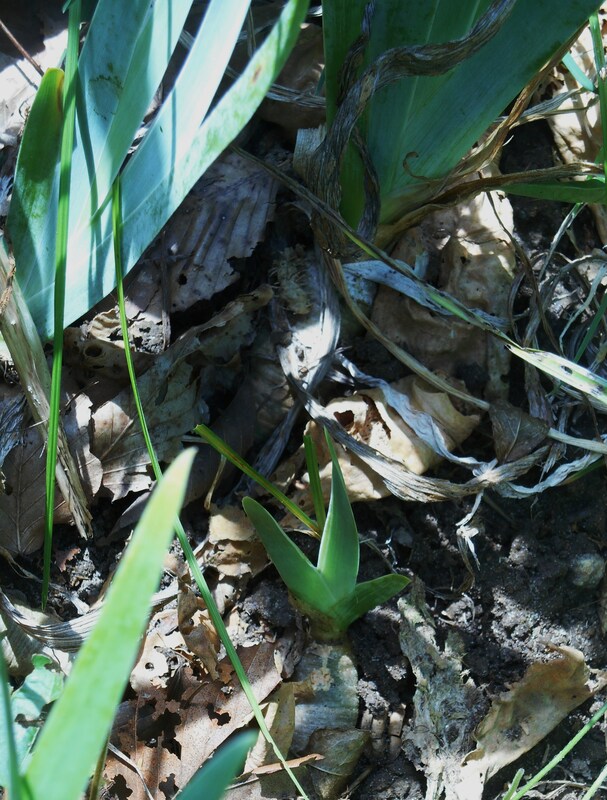 Iris rhizomes may be divided into small pieces, as long as each piece has at least one root. They are planted shallowly so the rhizome remains visible above the soil. Iris must be divided every few years as their rhizomes age and play out after a while. 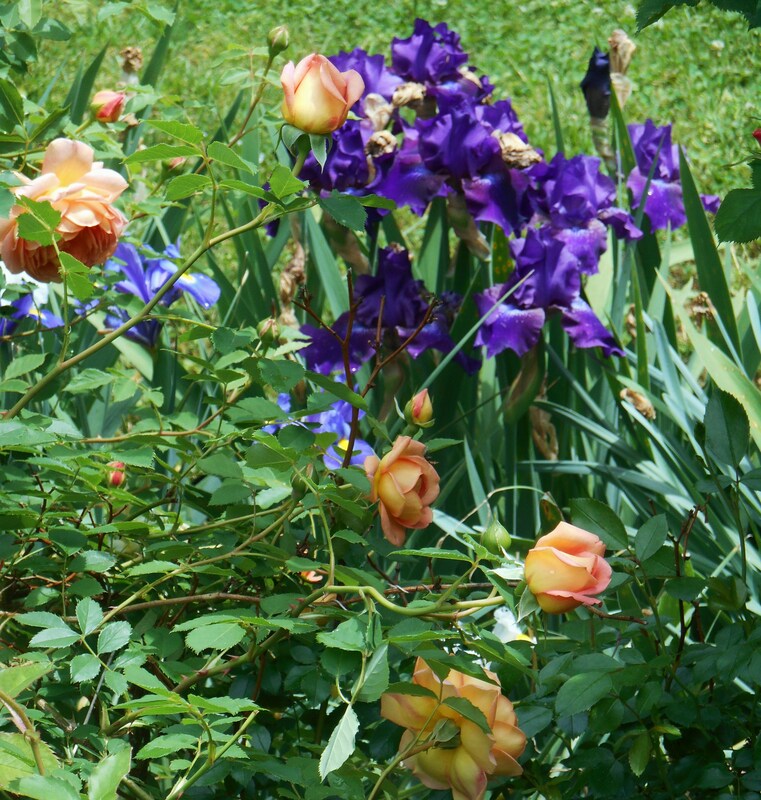 We grow mostly re-blooming Iris, which offer two seasons of blooms each year. Daylilies will clump and spread as well, as will many species of Rudbeckia. 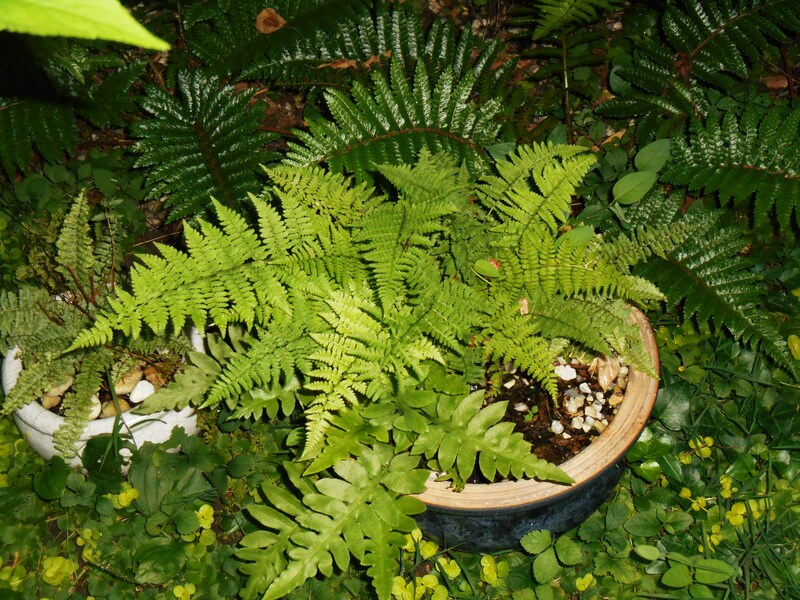 The large fern in the blue pot is my favorite tender lady fern, which spreads its self around generously. Most ferns spread by rhizomes, gradually growing larger and larger each year. Many ferns spread by rhizomes growing at or just below the soil’s surface. 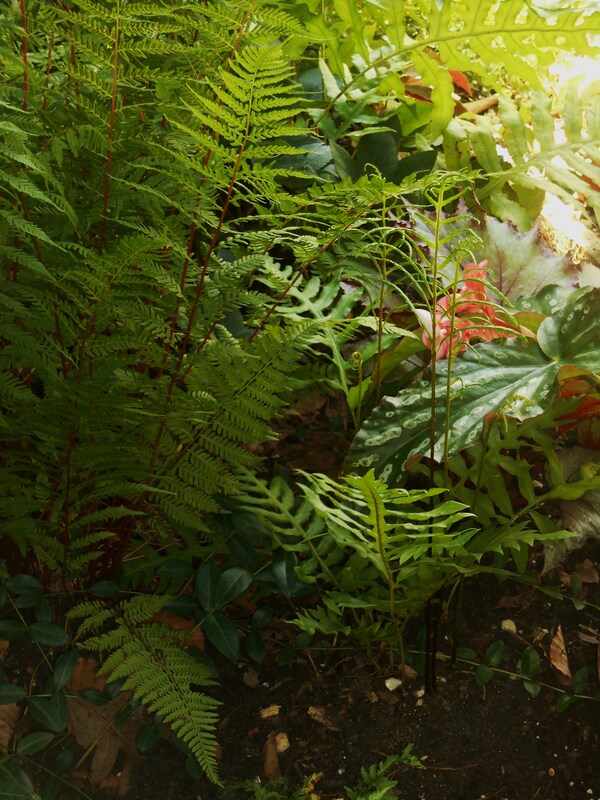 The Japanese ferns and various “walking ferns” are especially good at covering real estate. One of my tender lady ferns is especially prolific at spreading it self around a hanging basket or pot and may be divided again and again without harming the original plant. Many plants sold as ‘ground cover,’ like Ajuga, quickly spread out to carpet large areas of the garden. Ajuga, which forms a dense ground cover in one of our beds. Vines, like Creeping Jenny and Periwinkle, or Vinca minor can root at each leaf node, spreading themselves out indefinitely. Although only a few inches high, these plants spread quickly to offer large areas of uniform coverage in beds and under shrubs. 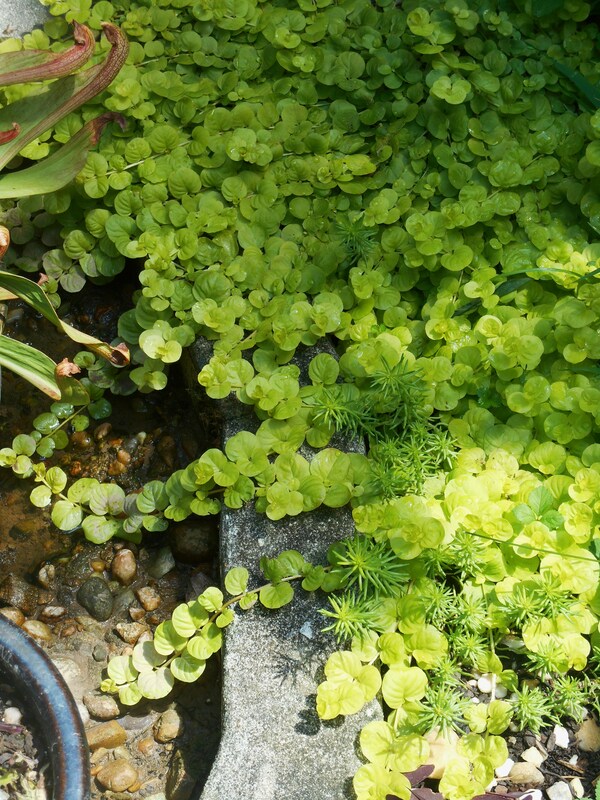 Creeping Jenny, easy to divide and transplant, grows quickly into a densly matted ground cover. 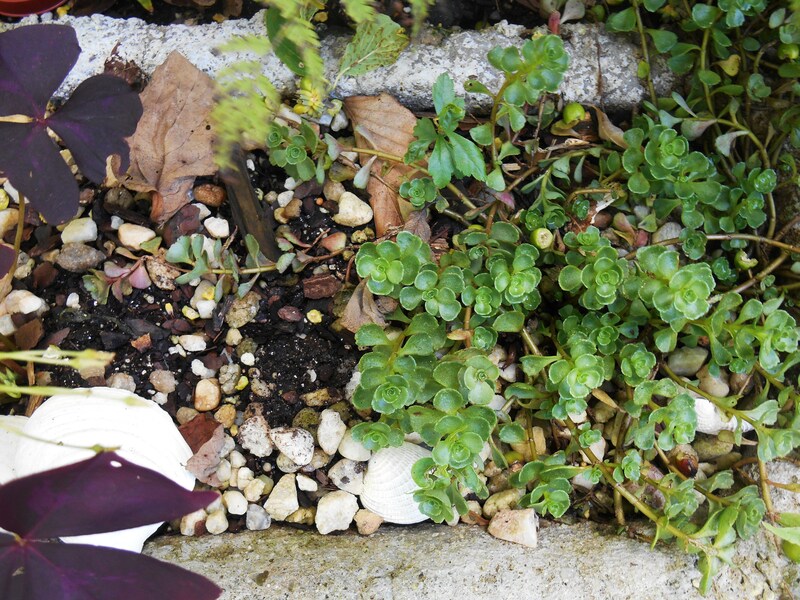 Here it is interplanted with a hardy Sedum. Many succulent varieties offer the same rapid spread through their rooting stems. These make good ground cover for pots as well as in rock gardens or sunny beds. 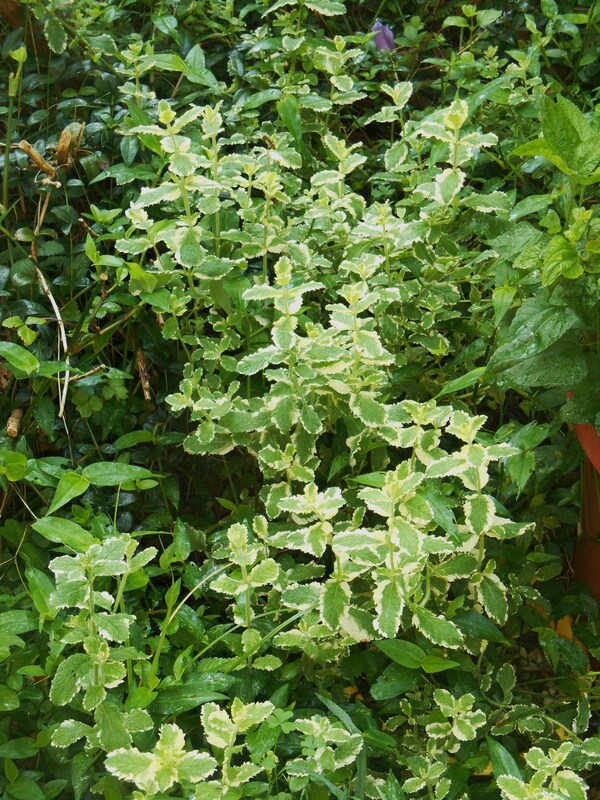 Members of the mint family, including Monarda and Lemon Balm, remain notorious for quickly spreading to cover as much territory as possible. Because their runners travel both above and below ground, one must be ruthless to yank out rooted stems growing beyond their boundaries. 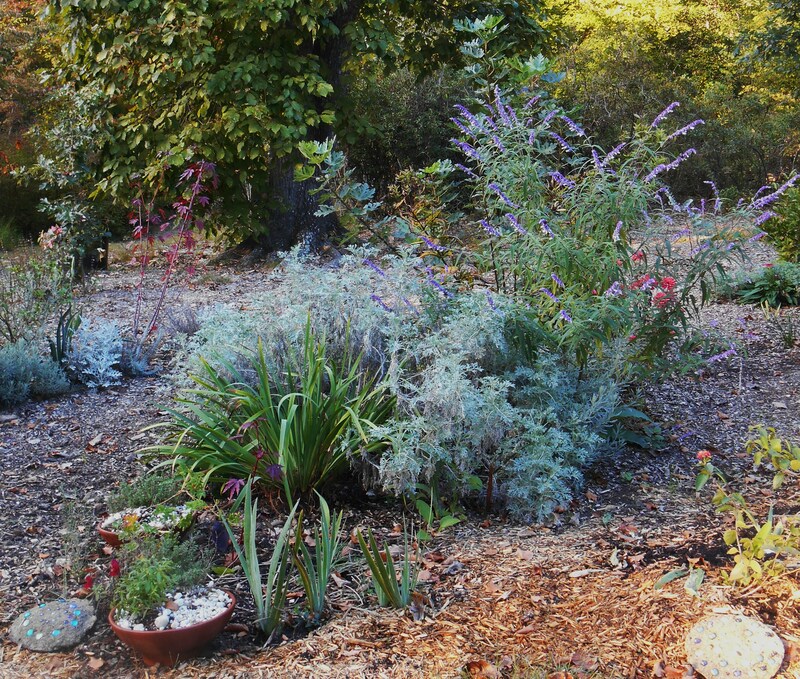 Shrubs, and even some trees, will increase through spreading rhizomes, as well. 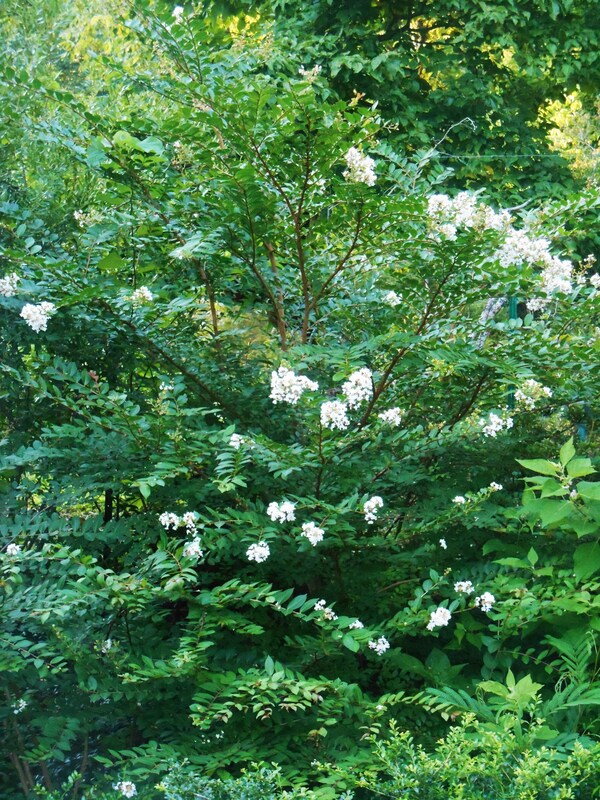 Hazel, Forsythia, Sumac, Lilac, Crepe Myrtle, some Figs and many sorts of berry bushes will quickly form large clumps. Crepe Myrtle tends to sucker and slowly spread. Lovely and prolific, many gardeners allow them to grow into a large area each year. This one has returned from its roots after being broken down in a 2013 storm. This ability to generate new plants, clones of the original, from spreading stems may be desirable to you or not; depending on your situation. If you have space to allow the expansion these new plants can be a blessing. 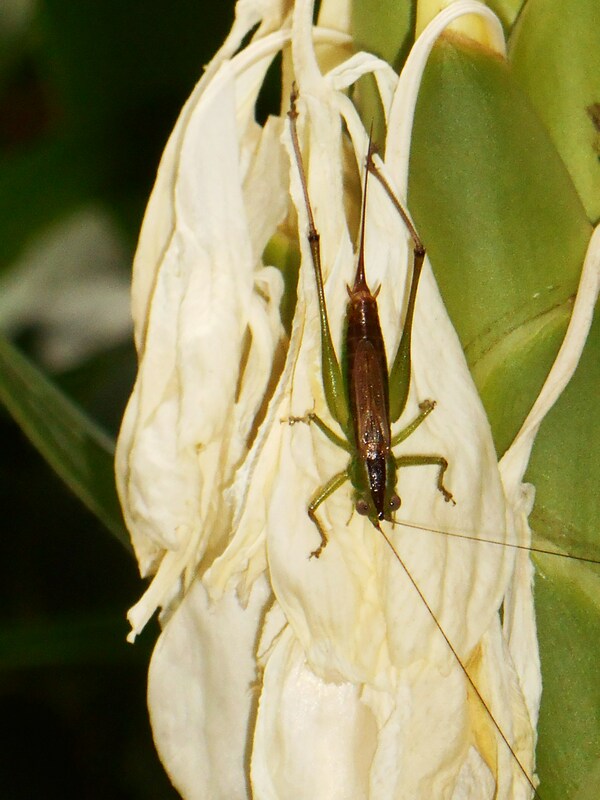 If you are gardening in cramped quarters, the spreading tendencies of many plants may become a nuisance. 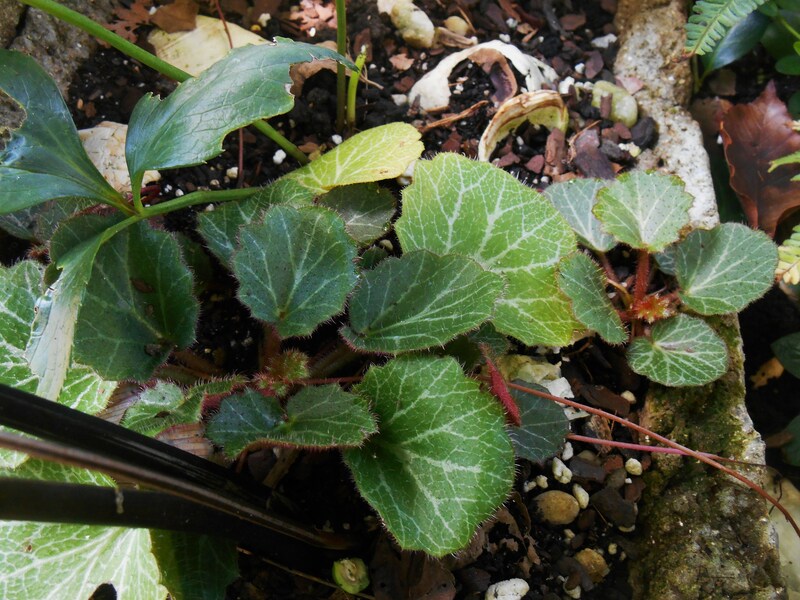 Strawberry Begonia spreads prolifically with long runners, tipped with baby plants which will root wherever they touch the soil. 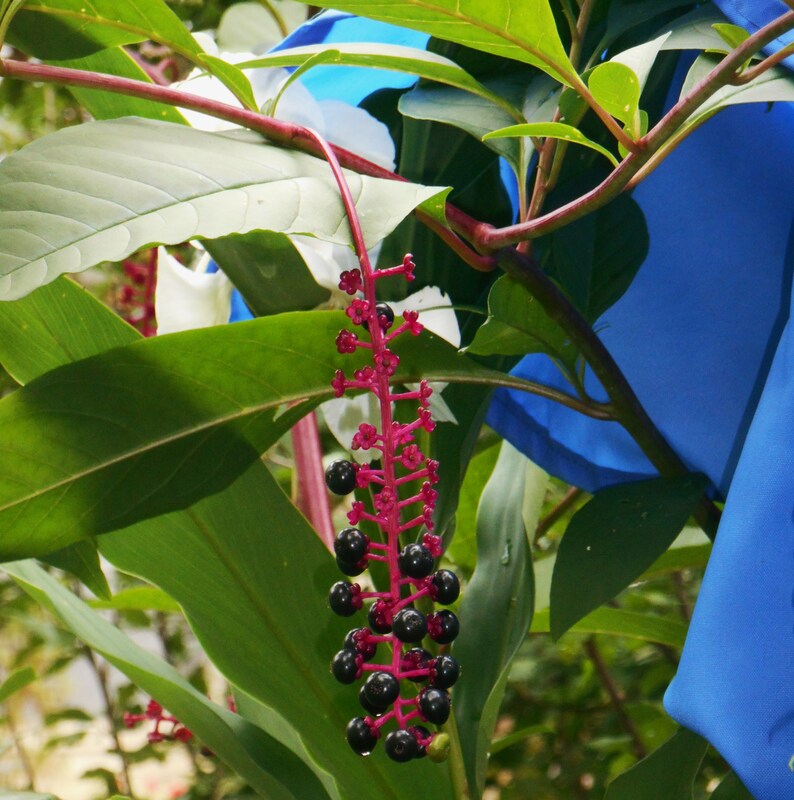 An attractive foliage plant, they bloom in the spring. It helps to have gardening buddies who are willing to receive extra plants, as well as those who will share free plants with us. Some of our favorite plants came as gifts from generous and loving friends. 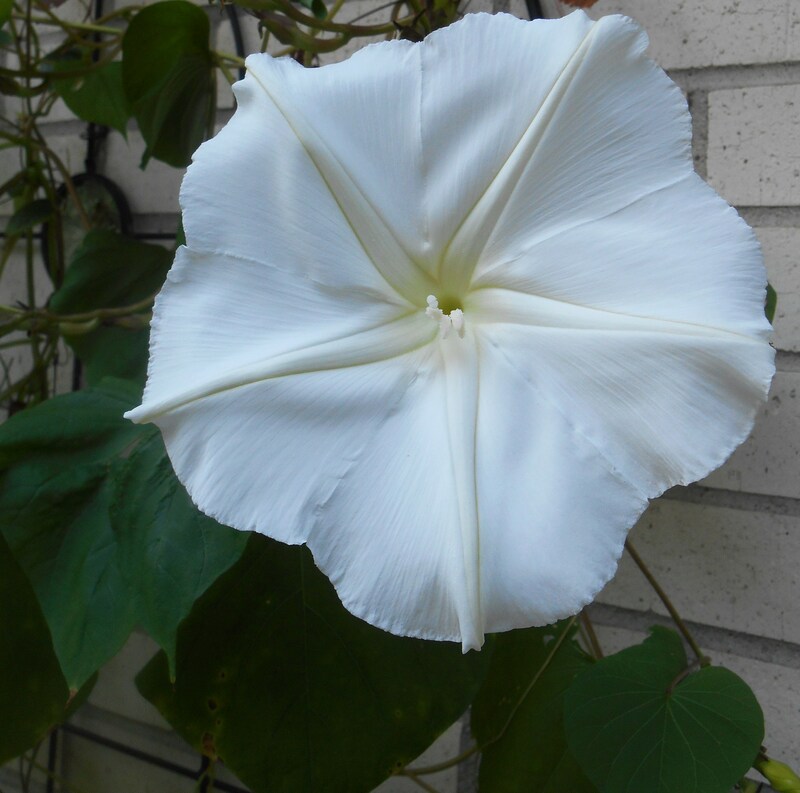 And we appreciate the prolific growth of our favorite plants each summer when they fill our garden with beautiful leaves and fragrant flowers. 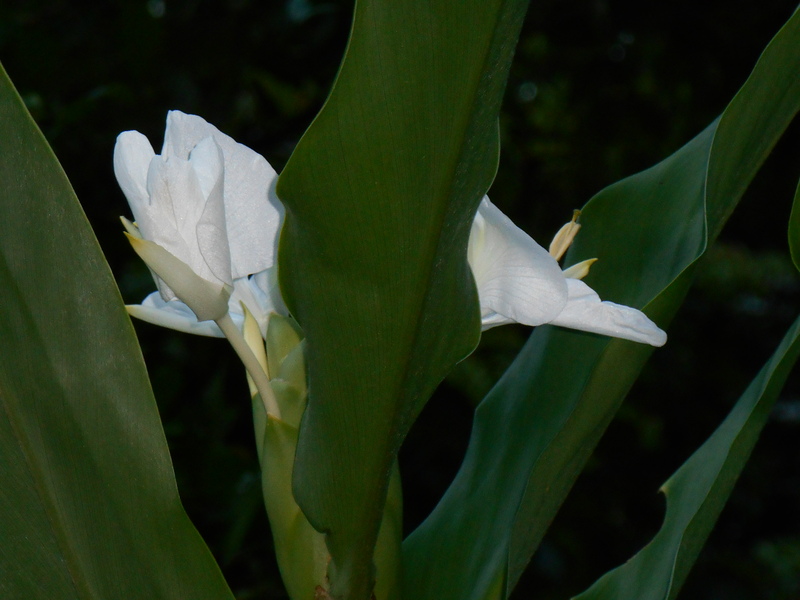 Our Ginger Lilies began to bloom late yesterday afternoon. Their perfume fills this area of the garden with an aroma reminiscent of Easter lily or rich honeysuckle. We’ve waited all summer for the pleasure of their blooming, and our stand of lilies is filled with buds, ready to burst open in the warmth of late summer. 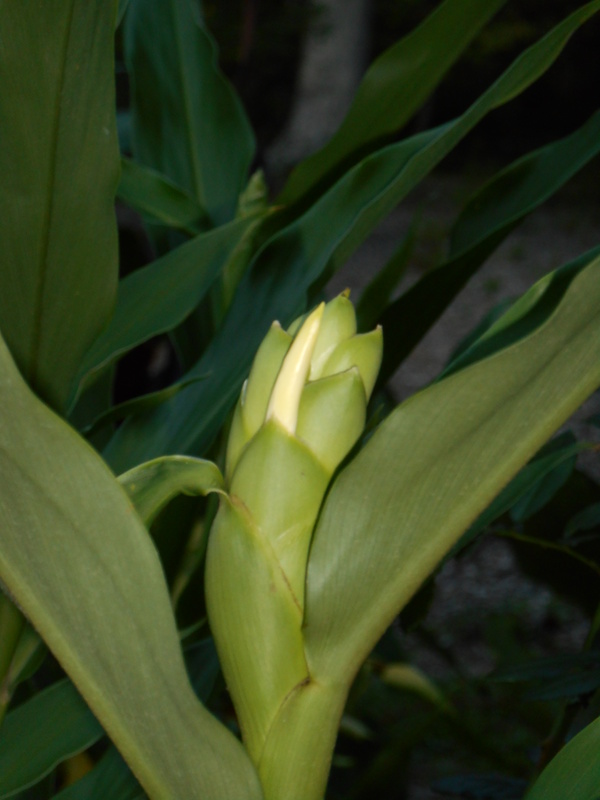 Ginger Lilies grow from rhizomes. These were a gift from a neighbor’s garden, and are hardy here in Zone 7. 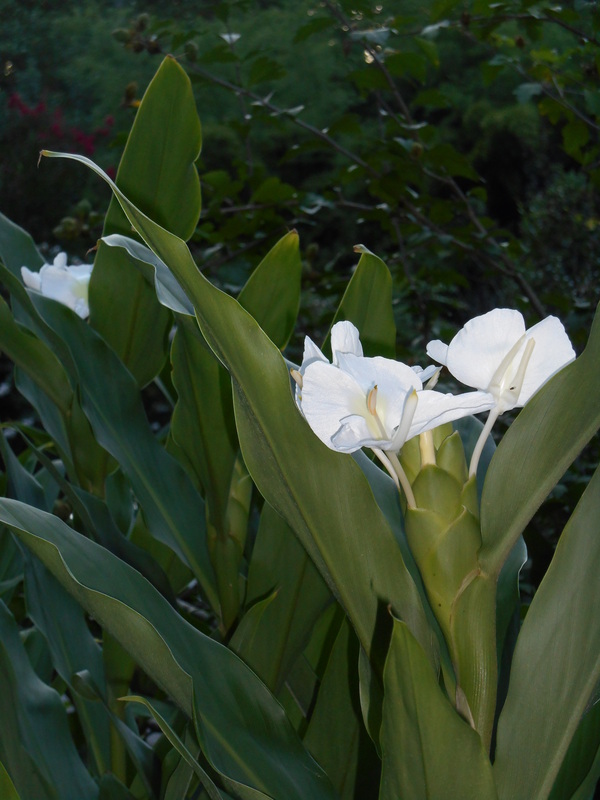 Many cultivars need warmer winters than Virginia offers, but these lilies have survived and multiplied every year, creeping beyond their original bed. 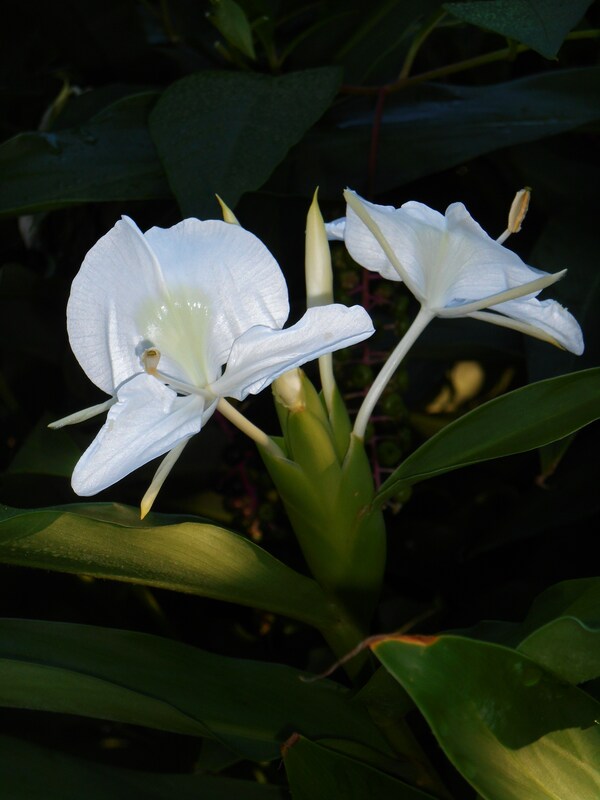 These are called “Hardy White Butterfly Ginger Lily”, Hedychium coronarium, in the Plant Delights catalog, and grow to between 5′ and 6′ tall. 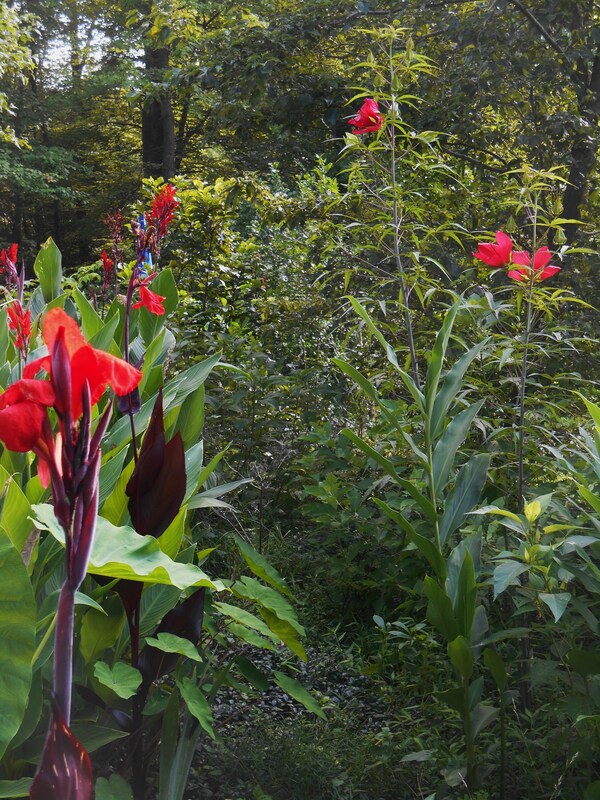 Aggressive growers, this stand of lily has grown thick and tall. 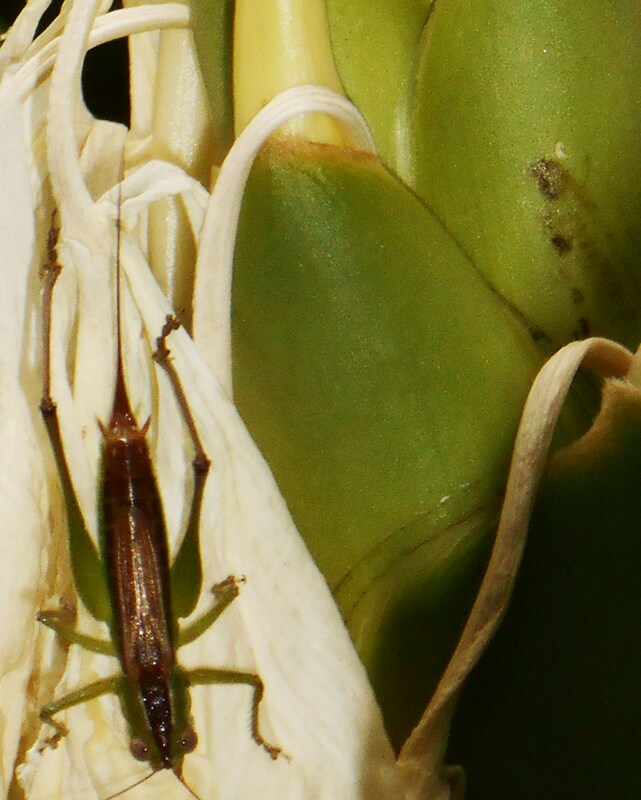 Like a field of corn, it offers a formidable barrier. Make up your mind where you would like a permanent display before you plant the first tuber, because they aren’t easy to relocate once established. The rhizomes are thick and tough. I tried to dig out a few of these which were growing too far forward this spring, into the roses’ territory. It was a tough job, and I didn’t get all of the sprouting rhizomes I should have dug. You can dig enough to spread these around once established, but I would recommend a backhoe if you decide to reclaim the garden bed for other plants. But what a sweet problem to have! 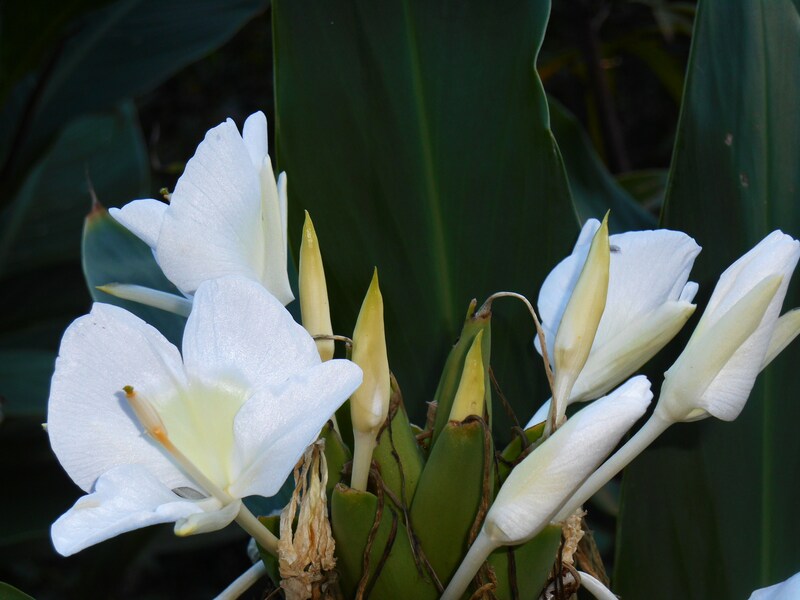 These Ginger Lilies are one of our favorite flowers in the garden. We are so appreciative to the neighbor who shared them with us. 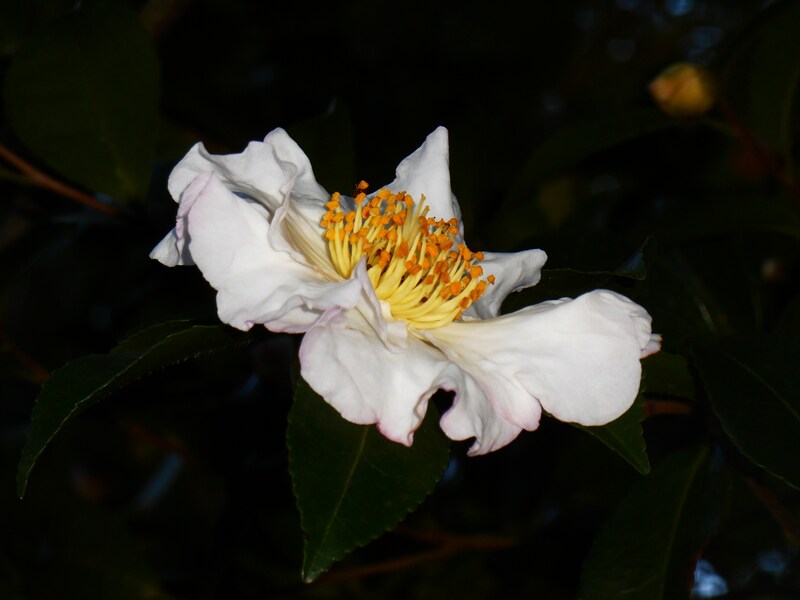 We will enjoy a constant supply of white fragrant blossoms from now until a heavy frost. These are one of the sweetest joys of late summer in our garden.